Jamie Evans takes an affectionate look back to his years playing with Alan Cooper and others at the Rumboe pub, Old Bailey, London. Picture: The Clyde Valley Stompers in 1963. 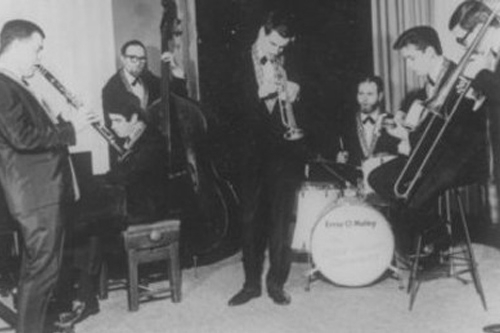 (L to R) Roy Pellett (clt), Jamie Evans (piano), Matt Peyton (bass), Ian Hunter Randall (tpt), Ernie O'Malley (drs), Les Muscutt (bjo}, John Howlett (tmb). The band broke up at the end of that year. I was an eager and industrious (well, at the start anyway) piano-player with the Scottish trad band, the Clyde Valley Stompers. I disliked the music but to be a sort of pop star and earn pretty good money and not have the drudgery of sitting in an office or factory all day was a form of paradise. Bert was playing piano for the Alex Welsh band and we were booked along with them and another band for a specific form of torture known as an “all-nighter”. Starting at midnight each band played a two-hour session until 6am when most of the audience were asleep anyway. I made myself known to Bert and we inspected the piano provided, a vile-looking ancient upright. I couldn’t believe my ears. Here was a jazz musician who didn’t want to be heard or actually do anything. But as I later discovered Bert certainly wasn’t unique but one of a breed of jazzers who delighted in doing as little as possible, starting as late as they could and finishing as early as they could get away with. Bert and I became friends over the years and round about 1976 I started getting calls from Bert to dep for him at the Rumboe pub on a Friday night. The format at the Rumboe was usually a trio, clarinet, piano and drums and the front man on a Friday was Alan Cooper, another eccentric and, to me at first, intimidating figure. 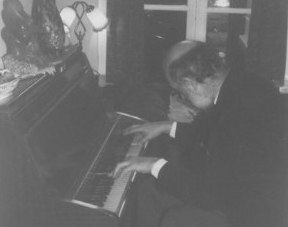 One of Bert’s more famous alcohol-fuelled exploits at the Rumboe was to do the entire session with the piano lid closed and eventually the management, like many before them, lost patience with Bert and fired him. I got the job thenceforth. Anyway on Friday nights, Coops and I formed an unlikely but reasonably popular combination. He was far more catholic than his Temperance Seven and trad band background suggested and our repertoire ranged from all the usual trad warhorses to more modern tunes, even Monk and Rogers and Hart. Coops and I were near-neighbours at this time. He lived in his Crapper mausoleum to Edwardiana - already well covered on this website - which looked out on Wandsworth Common, south-west London. I lived in a rather less salubrious road near Clapham Junction railway station. My wife, Mary, and I harboured vague hopes that the increasingly fashionable area around the Junction - Lavender Hill, Battersea Rise and Northcote Road - would eventually embrace our own house in Plough Road. We watched gloomily as the years went by and the trendy bars and restaurants gradually spread throughout the region , totally bypassing Plough Road. Coops and I probably looked an ill-assorted pair. He drove a left-hand drive Volkswagen six-seat pick-up truck and wore tweed suits, coachman’s topcoat and deerstalker hat. I dressed more in the fashion of the day in floral shirts, flares, long hair and my chops were always adorned with sideburns and “Zapata” moustache. Although there was only a decade between our ages I often felt we must have looked like grandpa and grandson. Our drummer Ray, inherited from a former trio, was a shadowy figure and I can’t remember much about him except that he performed well and didn't get in the way. For at least some of our three-year stint Coops used to take one of his art evening classes on a Friday and he would always arrive at the Rumboe late, surrounded by a throng of acolytes and students, all eager to buy him his favourite tipple at the time, barley wine and bitter. Coops had a huge range of musician friends and acquaintances and every Friday all sorts of characters would turn up to sit in with the trio - some good, some average and some absolutely awful. Among the more memorable ones were: Jack Hutton, former Melody Maker editor on trumpet; a singing double bass player whose name escapes me; Bopper Burns a tenor sax player who never spoke; percussionist Ian Howarth who later became our regular drummer and could drink a yard of ale in about eight seconds. The list could go on ad infinitum. One of the house rules we were asked to observe was “no singers from the crowd”. The management wanted a jazz pub and justifiably believed that if singers were allowed up with the band, the proceedings could degenerate into East End pub-type knees-ups. So I was surprised when one night a tall, dignified gentleman and his wife walked in. He bought drinks for the band and left banknotes at the bar for refills whenever we felt the need. He was greeted effusively by Coops - and I certainly warmed towards him myself after his generosity with the band refreshments. He then proceeded to sing “Won’t You Come Home Bill Bailey” with enthusiasm but little talent. Later I questioned Coops about the “no singers” policy. “That was Cyril Richardson,” he told me, rubbing his index finger on the side of his nose. “If Cyril wants to sing, Cyril sings.” The gentleman in question was one of the Richardson Brothers , the notorious gang who ran south London crime in the 60s. However Cyril was the white sheep of the family and ran a highly legitimate transport business, was a jazz enthusiast and one of the nicest blokes you could ever wish to meet. And he bought drinks for the band. So it was that if Cyril wanted to sing, Cyril sang. Picture: Coops tries out the piano at Jamie's Clapham Junction home. He was quite an accomplished pianist. As time went by Coops and I became good friends and would do any other gigs that came our way. I was playing on Wednesday nights with Alvin Roy’s band at the Prospect of Whitby, Wapping (that’s another story), working full time as a sub-editor on a trade magazine and helping run a family furniture business in Croydon. Consequently I was half comatose most of the time. Coops was still depressed at his wife’s departure with his two sons, Boris and Rollo. We would often carry on with a few more drinks into the early hours after the session, at his house or mine, and I can confidently say that I would wake up on a Saturday morning with some of the worst hangovers I had ever had. The Bolly (ie situated in Bolingbroke Grove), as Coops referred to his Wandsworth house, had by now become peopled with a strange collection of troglodytic creatures who lived in the nooks and crannies of the rambling pile. He had installed a housekeeper/girlfriend and they would often trawl the gutters of the Northcote Road vegetable market at closing on a Saturday afternoon salvaging any reject fruit and veg. I only remember joining Coops for Sunday lunch on one occasion. On the menu was belly of pork, stuffing and boiled cabbage which was a rich combination in any weather but on a hot summer afternoon, sitting in the kitchen super-heated by the Aga cooker, it was a formidable plate of food. Conversely in the winter the kitchen was the only warm room in the house and the rest of the place, unheated of course in Edwardian style, was absolutely freezing . We were using a rather more adventurous repertoire as the years progressed so amongst the “Shine” and “Indiana” trad standards, we were slipping in “As Time Goes By”, “Night and Day”, “Tea for Two” and “Can’t We Be Friends” . This, of course, was met with disapproval by the trad-minded members of the audience but we were attracting a more open-minded clientele on the whole. Picture: Christmas at the Bolly. 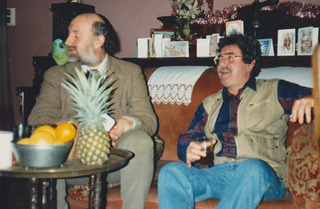 Coops (with his beloved parrot on his right shoulder) and Jamie in festive mood. The years passed by and by 1978 we had become what, one of my old mates from the Bill Nile band, Ron Brown, .referred to as cult (or perhaps I misheard the word?) figures. Ron was averse to paying a compliment if he could avoid it, so I took that as a serious bouquet. I remember looking at the audience one night and seeing quite a few well-known musicians and Roger Horton who ran the 100 Club. Maybe he’ll give us a gig at his place I hoped? But he never did. Others who knew Cooper better than me warned that he would probably start getting bored and gradually he began to put in more deps.. Sometimes that was fine when they were people of the standard of Geoff Simkins who later became a leading alto-sax player in the British modern scene. But, no names no pack drill, others were quite terrible and it was not much fun doing an evening of mediocrity. I couldn,t really work out why he wasn’t right as he’d been filling the place with an extremely satisfied crowd for Friday after Friday. I also remember the drummer, Ian Bell, who fixed all the musicians for the Rumboe telling me what problems he had keeping the bands happy at times, with some clarinettists refusing to play with certain pianists and drummers and vice versa. Ian loved a taste by the way, and I’ll never forget one session I did with him on drums when he was just about able to stagger to his kit but proceeded to play perfectly for the entire evening. Everything passes and I think it was at about Easter 1979 that Cooper and I were summarily sacked, he to be replaced by an alto player who had been hanging around and sitting in on a suspiciously frequent number of occasions. The drummer, Ray, was retained so he must have got the management’s seal of approval. Maybe the job had run its course after three years and I still regard it as a great privilege to have played with a brilliant clarinettist and learned a lot from him as well. So it was RIP the Rumboe Years but there was far more to come later. All will subsequently be revealed.